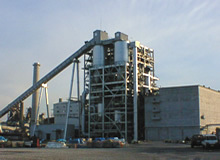 The Itoigawa Power Plant was constructed adjacent to a cement plant in Itoigawa City, Niigata Prefecture, and is operated by an IPP that supplies electricity to Tohoku Electric Power, one of Japan's major power companies. The use of a 149 MW coal-fired CFB boiler in this power plant is a first for an IPP in Japan, and this effectively reduces NOx emissions. This power plant also recycles at an adjacent cement plant the fly ash that is the byproduct of coal combustion. To adjust to shifts in electricity demand, the customer runs the Itoigawa Power Plant in swing mode. During the daytime hours of high electricity demand, the plant is run at up to 100% of its capacity, with output being adjusted flexibly in response to commands from a central load dispatching center. At night the plant is operated at just 40% of its capacity. 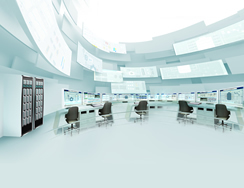 Yokogawa fully implemented the operation logic for its highly-reliable CENTUM CS control system to match frequent load changes and provide a high degree of flexibility in the system's operation. The CENTUM control system also supports automatic shutdown/startup to keep to a minimum the manual checks performed by operators. They are only required to check the master control sequence for stopping and starting the plant facilities, which ensures a safe, smooth shutdown and startup. Since commencing commercial operation in July 2001, the Itoigawa power plant has been operating reliably and efficiently under its Yokogawa CENTUM control system while employing CFB technology to generate environmentally-friendly electricity.